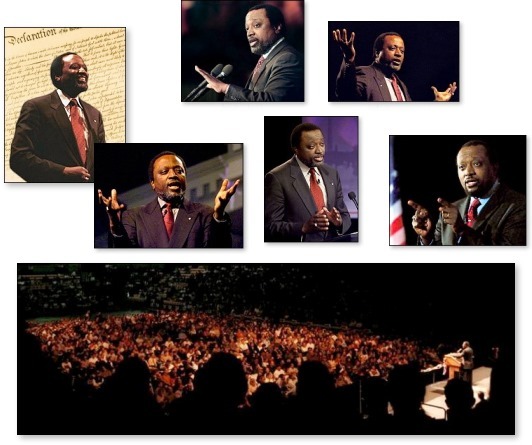 Scheduling Alan Keyes to speak Ambassador Alan Keyes is one of America's pre-eminent speakers, commentators, and constitutional scholars. He is also renowned for his political advocacy and activism. He ran for president in 1996, 2000, and 2008, and was a Republican nominee for the U.S. Senate from Maryland in 1988 and 1992, and from Illinois in 2004 — when he challenged Barack Obama for the open Senate seat and took on the notorious Chicago Democratic machine. During the Reagan years, Dr. Keyes was the highest-ranking black appointee in the Reagan Administration, serving as Assistant Secretary of State for International Organization Affairs and as Ambassador to the United Nations Economic and Social Council. His basic philosophy can best be described as "Declarationism" — since he relies on the self-evident truths of the Declaration of Independence to define the premises on which our country was founded, and to which it must return if it is to survive. To Dr. Keyes, the Constitution itself cannot be faithfully interpreted, understood, or applied apart from the divinely-premised principles of the Declaration. He is best known for thrusting the evil of abortion — which he considers our nation's "greatest moral challenge" — into the national spotlight. 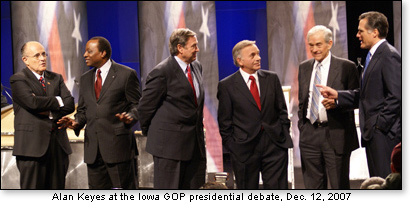 When Keyes ran against Barack Obama for the Senate in 2004, he did so because he was incensed the Democrat "community organizer" had refused to support the Born Alive Infant Protection Act as a state senator on several occasions — a measure approved unanimously by the U.S. Senate. Dr. Keyes blogs at LoyaltoLiberty.com, and writes commentary for WorldNetDaily, BarbWire, and Daily Caller. The former Assistant Secretary of State is available to address interested venues of students, educators, civic groups, professional organizations, public servants, political advocates, churches, and others who are interested in preserving our nation's institutions of liberty. To arrange a speech or special appearance by Dr. Keyes, please contact us.